The beauty of Independence Day, or more commonly referred to as the Fourth of July, is that it’s a holiday that every single American can celebrate. It brings all groups together to celebrate one country. It celebrates the Declaration of Independence, declaring our independence from Great Britain in 1776. It celebrates the freedom we enjoy each day that we live in this country, freedom to worship, to work, to own our own homes. To remind us and to celebrate this milestone of our country, we shoot off fireworks, attend parades, host barbecues, take boat rides and altogether enjoy a long weekend of good food and good company. While participating in all of this festive fun, we need to remember what we’re celebrating by showing our pride for America. America needs our pride and support. Display your appreciation and admiration of America proudly inside and outside of your home. Before you host that barbecue or pool party, fill your home with the patriotic colors of red, white and blue. It is holiday décor that everyone entering your home will relate to. Plus, it’s cheery colors that are sure to brighten any mood! What kind of red, white and blue décor can you add? Just about anything! Inside, create pillow covers in red and blue, or if you’re really skilled, sew flags onto white pillow covers! Display them on your sofas, outdoor lounging chairs or dining room chairs. Place solid red, white and blue place settings on the dining room table, switching off colors. Or, drape a patriotic tablecloth over your table for less cleaning! 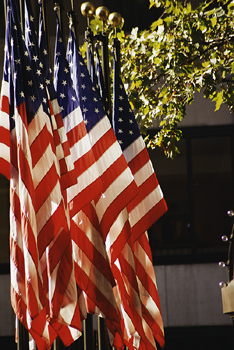 Purchase miniature American flags from a craft shop or just about any store this time of year. Place a flag or a bouquet of flags in vases and display the vases around your house. Hang patriotic window stickers on the windows or glass doors. Use red, white and blue dishware and cups. Serve red or blue Kool-Aid or punch. Fill bowls in your kitchen with red, white and blue foods, such as white onions and red apples or tomatoes. Serve a fruit salad with blueberries and watermelon, or serve blue corn chips with red salsa. Decorate a cake, cookies or cupcakes with colors in the American flag! Create a centerpiece for your kitchen table or your patio table outside. The centerpiece can include a basket filled with baseballs and American flags, it can be a vase of red and blue flowers, or it can be a watering can filled with striped pinwheels. Get creative! Outside, the number one rule is to hang a full-size American flag from your house. This is something every American family used to do and should continue to do. After you’ve hung the flag, switch the bulbs outside of your house with blue or red bulbs. Place a patriotic cover over your mailbox. These can be purchased or created from scratch with a sketch drawing, painting or photograph. Hang white tissue lanterns from your porch after gluing green and red strips of ribbon around them. Fill flower pots or hanging baskets with red, blue and white flowers to flank your walkway or front door with. In the backyard, place a pot in each corner of your patio or deck. Use American flag beach towels to drape on your outdoor furniture or by your pool. Hang one of these towels on the side of your shed. Hang a patriotic greeting on your front door, such as “Stars and Stripes Forever,” “America the Beautiful,” “United We Stand” or any one of your favorite American sayings. For ideas on how to decorate for the Fourth of July in green, eco-friendly ways, check out this previous Buy Owner Blog post!